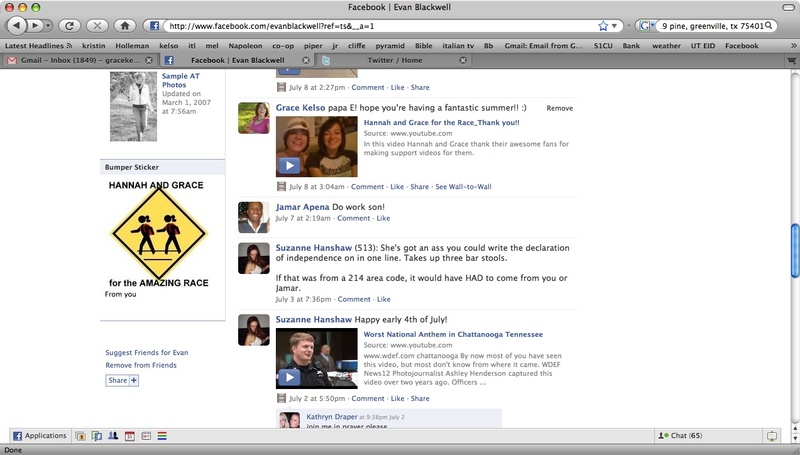 I love that I can still find remnants of our campaign on friends’ Facebook profiles and Twitter accounts. I found this one from my friend Evan today, and it made me smile. 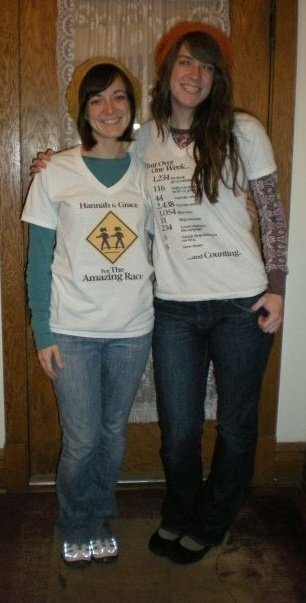 Well, it has been entirely too long since I’ve given an update and Hannah and I still constantly have people asking us what ever happened with all our Amazing Race craziness, so I figured it was time I give an official update/wrap-up explaining what went down. 1. I was not 21 at the time of the Chicago audition (I just turned 21 June 14) and since the audition was held at a casino, the casino manager refused to let me step foot onto the carpet (their is a law in Illinois that states that if anyone under 21 steps foot on the casino carpet, they get fined $100,000-and you had to cross the casino floor to get to the room where auditions were being held). 2. We discover another audition to be held a few weeks later in North Richland Hills (not at a casino this time) and decide to go to it. It was then canceled due to the swine flu outbreak in the area. 3. North Richland Hills audition is re-scheduled for May 23, which just so happened to be my graduation day. We would have gone except my parents had already bought plane tickets to come and see my graduation. Figures. 1. Everyone should be able to be a little crazy and spontaneous at least once in their lives. We took some risks, went with our gut and never gave up. 2. 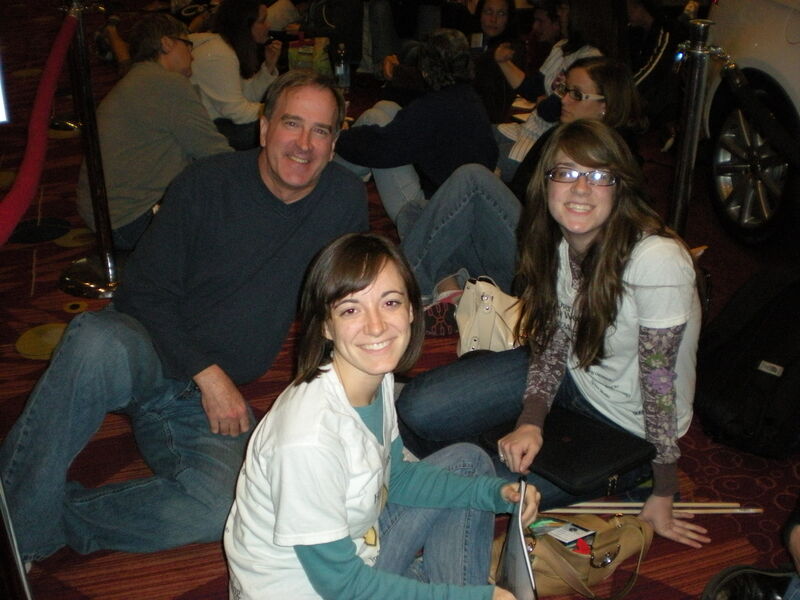 We got to spend a wonderful weekend in Chicago, one of my favorite cities (Hannah had never been)! We had an absolute blast, and got to spend some great time with my family in Oak Park while we were there. 3. We got to put into practice all the things we’ve been learning about in college, and actually see our campaign work. Granted, we didn’t get on the show, but we set out to brand ourselves as an excellent team for The Amazing Race, and we did just that! 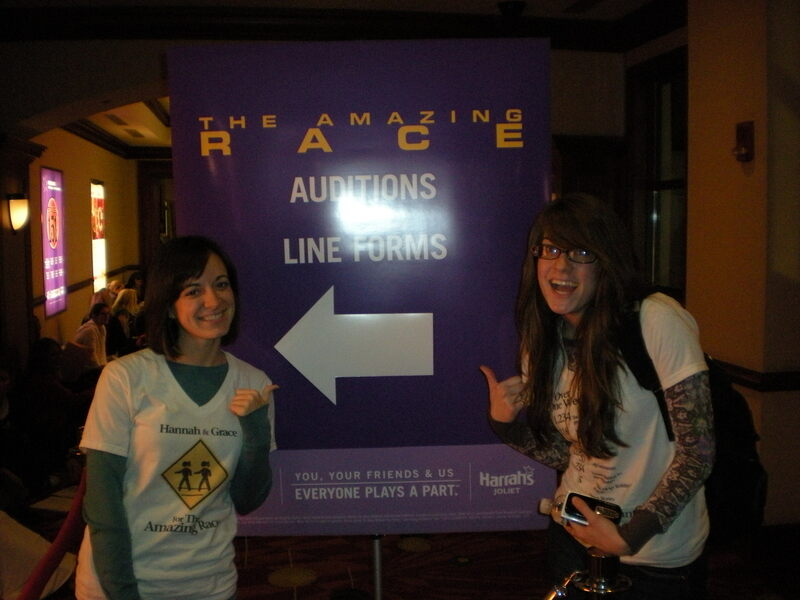 This is evident by all the people who now know us as the crazy Amazing Race girls and constantly ask us how the auditions went – My academic advisor even asked me about the auditions at my graduation as I was waiting to cross the stage! Hannah’s friends always ask her what happened, and I get asked by a new person at least once a week how things went. 4. I made some excellent connections with my professors, deans of UT’s College of Communication, department heads within the college, as well as marketing executives at local businesses. I was able to expand my professional network and strengthen relationships with experts in the PR and Advertising fields, and I would not have been able to do that otherwise. Hannah and I are doing well. I’m enjoying being my summer off and the fact that I am now a Texas Ex (Hook ’em Horns! ), and Hannah is not enjoying summer school. She’s taking two years worth of Spanish in two summer sessions. Needless to say she’s pretty busy. It will all be worth it for her though when she graduates in August instead of December like she originally thought. Hannah is currently looking for a PR/Marketing job in the Dallas area. I on the other hand, will be moving to Naples, Italy in the October! I will be going through the IMB’s Journeyman program and will likely be teaching English and auditing some classes at one of the universities in Naples. I will be there for two years. So, quickly, because I’m supposed to be studying right now, I wanted to give everyone a heads up on what on earth is going on with us. #1. Travel to Chicago to audition. Auditions held at a casino. #2. Kicked out of casino. Not allowed to audition because I’m not 21 (birthday June 14, 1988) and they won’t let me step foot on the casino floor to audition-apparently they get fined $100,000 if an under 21 year-old enters the casino floors. #3. Have a fabulous time hanging out with my family in Chicago and exploring my favorite city. #4. Find out about auditions in Dallas (North Richland Hills) May 2. #5. Deccide to go to May 2 auditions. #6. Decide not to go to May 2 auditions because of my group projects. Refuse to bail on my groups again this weekend. #8. Call Hannah. Tell her the audition is back on. #9. Hannah gets call from her dad. 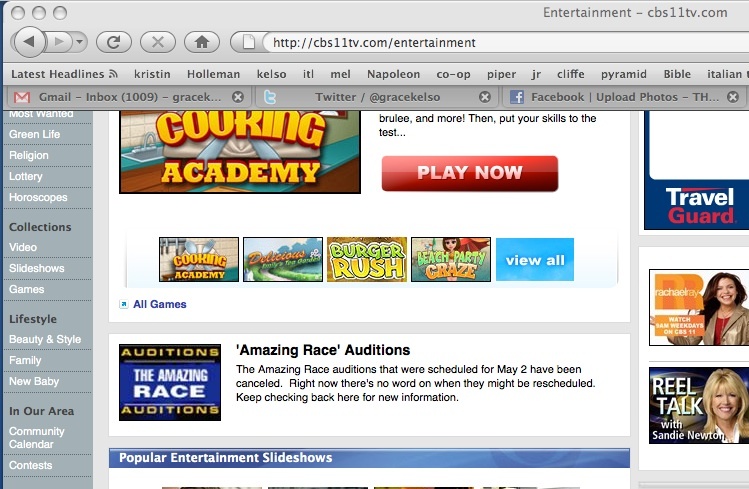 Saw on the news that audition is canceled. #10. Check internet to confirm/deny cancellation. Confirmed. So lame. So, we didn’t audition today in Dallas (canceled). We have no idea why they canceled them or if they will in fact reschedule them. At this point, we’re content with whatever happens. If they don’t hold an audition in Dallas, we had a good run, if they do, we’ll go and see what happens. I’m so sorry I haven’t been able to update the blog this week. It’s been a crazy busy week, and I need to make sure that I do in fact graduate this semester, so I figured it was time to put the race campaigning on hold for a bit. I’ll give a full debriefing on what I’ve learned throughout this process, the final stats of the campaign, and where my head is at after all this insanity, once I’m done with all my schoolwork. This probably won’t be until next week. My last day of class is Friday May 8, so after that I’m FREEEE, and will tell you all about this crazy adventure. Hope all is well with you guys, and will keep you posted as soon as I get a second to breathe. Again, thanks so so SO much for all your love and support. I just can’t tell you what it means to me. Even MORE awesome fan videos! We love you guys! Thanks for the support! So, we just found out about an audition in the Dallas area this Saturday, May 2. And guess who is crazy enough to give it another shot? 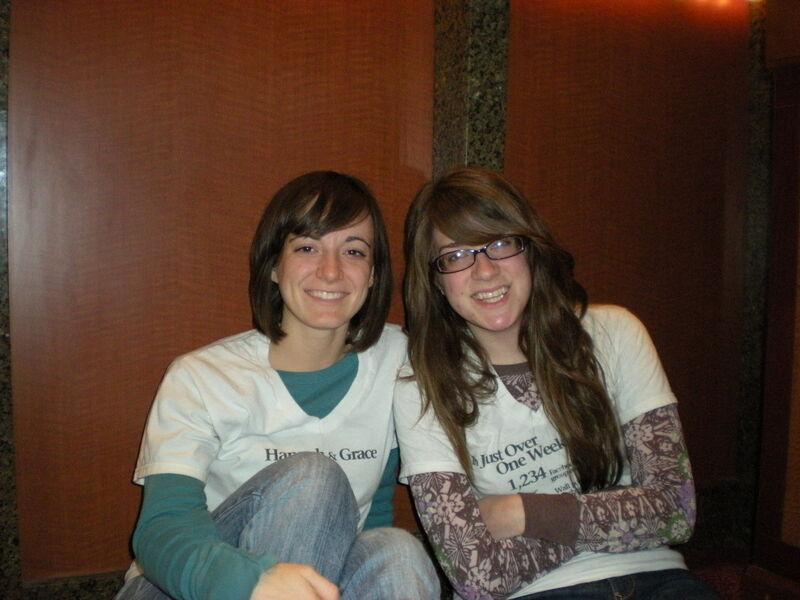 That’s right, none other than Hannah and Grace. You only thought you were done with us! Looks like we’ll still be needing everyone’s help. Watch the blog for more updates and how you can help! Us at the casino. Waiting. Dad pretending he’s going to go gamble away all his money. Ha HA! Yeah right! More waiting. Hannah’s worn out. Even MORE WAITING! We’re No. 4 in line!